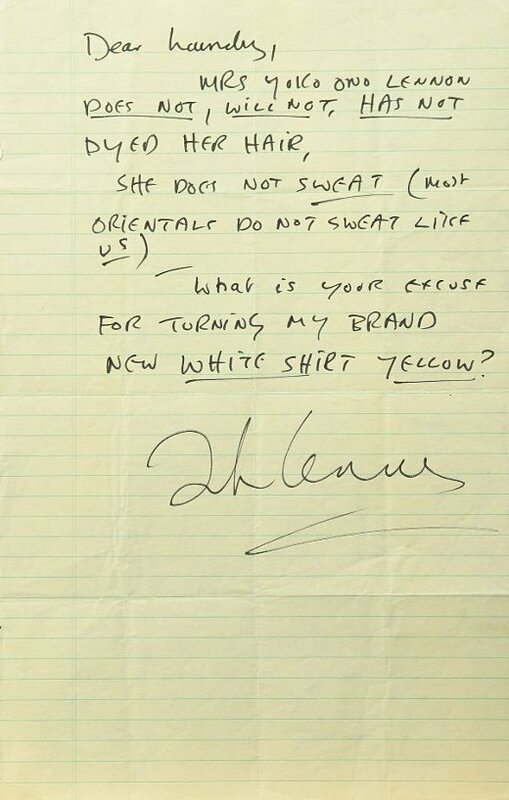 An irritated John Lennon wrote the following note - currently on display at the Mansion on O - in the 1970s, after discovering that one of his white shirts had somehow turned yellow in colour whilst at the hands of some laundry workers. Clearly, Yoko Ono had nothing to to do with it. Transcript follows. Image courtesy of Gene Teale, but additional thanks go to Andrew Warlick for also suggesting this letter. MRS YOKO ONO LENNON DOES NOT, WILL NOT, HAS NOT DYED HER HAIR. What is YOUR EXCUSE FOR TURNING MY BRAND NEW WHITE SHIRT YELLOW?